Our run club isn’t a club you have to join or pay an annual membership for. All you need to do is show up with your shoes and a smile. 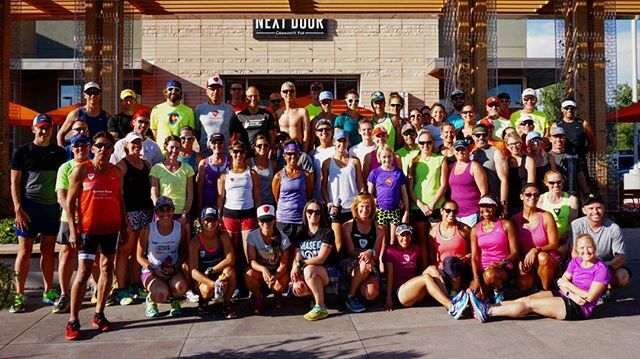 Runners Roost Run Clubs are offered at all Roost locations and are open to all. We have first time runners, walkers, and competitive athletes who show up, run and enjoy great conversations, some snacks and maybe a beer after. Be on the lookout for themed run club nights, offers from our vendor partners and special guests at the Roost nearest you! Interest in Joining? Sign our Waiver. See all store free weekly group runs. All runs are followed by post-run refreshments. Where: Our run club meets at Runners Roost Lakewood every week. Enjoy routes of multiple distances through beautiful Belmar Park! After the run join the club for food and drink specials at Rocko’s Cantina. Where: Our Wednesday night runs follow a rotating weekly location schedule. See our events calendar for the next location. Where: Our Monday night runs meet at the University Village of Colorado on Nevada. Our Thursday night runs meet at Thunder and Buttons in Old Colorado City.